MD (Dermatology) kasturba Medical College,Mangalore Year of Passing – July 2005. M.B.B.S , M.R Medical Collage, Gulbarga,Year of Passing – Jan 1998. Post Doctoral Training Internship,M.R Medical Collage, Gulbarga,Year of Completion – Apr 1999. Trained in Dermato surgeries like Partial thickness skin grafting for vitiligo patients, Scar revision surgeries, Earlobe keloid surgeries, Rhynophyma Debulking surgery, Nail Surgery, Electrocautery, Laser and Radio frequency surgeries, Cryotherapy/Cryosurgery. Expertise in Cosmetic procedures like Acne Scar Resurfacing including (Dermaroller, subscicion, Fractional Co2 laser, Chemical peels & Microdermabrasion), Mesotherapy, Sclerotherapy, Lipolysis, Active Q-witchend-Yag laser, Long pulsed Nd-Yag Laser, Co2 & R.F Excited Fractional Co2 laser, Intensed pulse Light, Tattooing, Vast experience in variety of Chemical peels (almost 20 different types), Microdermabrasion, Stem cell electrophoresis, Patch Test, Mesotherapy, Injectables - “Botox and Fillers” , F.U.E hair transplantation. Life Member “Indian Association of Dermatologists, Venereologists and Leprologist” Regn No. LM/AP – 4080. Life Member “Cosmetic Dermatology Society (India)” – Regn No. LF – 1071. First Author – “VARIANT OF VOHWINKEL SYNDROME” A CASE REPORT, IND JR of DERMATOL, VEN & LEP. Co-Author - “A.L.L & SPORIADIC NEUROFIBROMATOSIS” - Letter to editor, IND JR of DERMATOL, VEN & LEP. Recived gold medal for the best paper in category of Award study for paper titled “NAIL IN HIV, A NEW INSIGHT ” at 13th South Zone Conference of Indian Association of Dermatologists, Venereologists & Leprologists held on 24th to 26th September 2004, at JIPMER, Pondicherry, India. Awarded “FELLOWSHIP IN A ACADEMY OF GENERAL EDUCATION” on 5th August 2005 by The Academay of General Education, Manipal, Karnataka, India. Awarded “DIPLOMA IN AMERICAN ACADEMY OF AESTHETIC MEDICINE AND SURGERY” July 2013 by ‘AAAMS” at Dubai,U.A.E. 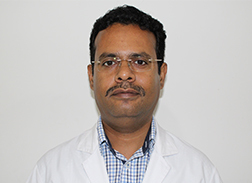 Chairperson for the session on What’s new in Dermatology, during the DERMACON 2015 at Mangalore on 14th Feb 2015.